Distinction: Comey understood Trump request to "let go" of Flynn pertained to probe of fmr NSA's lies, *not* broader Russia investigation. I had understood the President to be requesting that we drop any investigation of Flynn in connection with false statements about his conversations with the Russian ambassador in December. I did not understand the President to be talking about the broader investigation into Russia or possible links to his campaign. I could be wrong, but I took him to be focusing on what had just happened with Flynn’s departure and the controversy around his account of his phone calls. Trump asking for any sort of special legal dispensation for a political friend and ally is at least ethically questionable, but this clarification delivers a blow to the Left's collusion/cover-up narrative. Trump was trying to help his buddy out on a tangential matter (this was inappropriate and foolish); he was not trying to uproot, derail, or weaken the larger Russia investigation, in Comey's mind. That matters. The picture that emerges here, in my view, is that of an exasperated president who believed his presidency was being stymied by unfounded innuendo, and who wanted the country to know what the FBI Director had told him privately on multiple occasions. Comey was reluctant to do so because if that status were to change (i.e., if Trump did become a target as new evidence was uncovered) after he'd publicly gone on-record about the question, he would be compelled to disclose that update (just ask Hillary Clinton about this). Such a hypothetical pronouncement alone could do grave damage to Trump's administration, even if that strand of the probe ultimately ended up leading nowhere. It seems Comey did assure Trump that he was not personally under investigation and Comey's reluctance to make that public infuriated Trump. 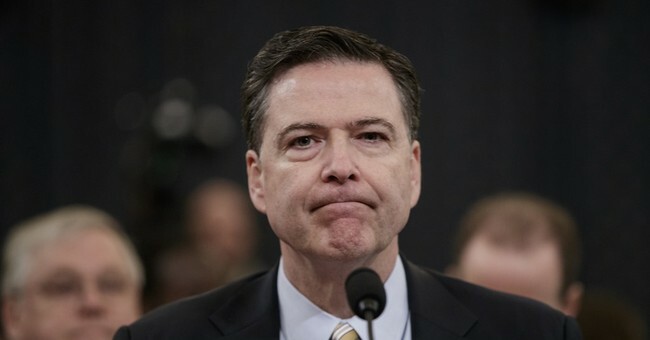 Today's question-and-answer session may be illuminating and uncover more important information, but what Comey's opening statement indicates to me, especially when coupled with various news reports, is this: President Trump was incensed that (what he sees as) a totally bogus Russia storyline was hijacking his presidency and was therefore extremely eager for exculpatory details be shared with the American people by credible law enforcement and intelligence officials. This reasonable desire led him to basically beg Comey -- and likely DNI Coats and NSA chief Rodgers -- to state on-the-record that he was not under investigation for anything related to collusion with Moscow during the campaign. He also obviously believed that Michael Flynn was innocent of deeper nefariousness vis-a-vis Russia, and that any ancillary prosecution related to his inaccurate statements would therefore be over-the-top and unfair (hence his problematic "let it go" ask). It should also be noted that both Coats and Rogers refused to answer whether Trump asked them to intervene with Comey yesterday, but Comey's upcoming testimony strongly suggests that Trump probably did. Both men also denied that they were ever ordered or pressured to do anything improper or unlawful. And thus we have more nuggets in an emerging portrait of a mercurial, impulsive president who routinely failed to recognize or adhere to boundaries of ethics and propriety in the realm of intra-executive branch dynamics. It feels reasonable to conclude that when Trump's fury boiled over after members of "his team," as he viewed them, declined to back him up, he sacked Comey. Whether his overall actions amount to illegal conduct is open for interpretation, but that case still feels thin to me. Alternate explanations for his behavior -- some rooted in Trump's unattractive (but not necessarily criminal) qualities of emotionality, ignorance and arrogance -- abound. The single most damning piece of evidence against the president is his call to fire Comey after the FBI's probe into Flynn did not close up shop in accordance with his wishes, amid murky and shifting justifications from the White House. A plausible case can be made that Trump resented Comey's commitment to the FBI's independence and canned him for refusing to do his bidding on behalf of a political ally. That would reek of obstruction. But an equally plausible scenario is that Trump was fed up with Comey's unwillingness to simply repeat private assurances in the open, which he thought would help lift a distortionary and distracting cloud hanging over his administration. Hell, both parties seem to hate this guy anyway, and he's playing games on this Russia stuff, so I'll replace him, Trump may have thought, in a fit of pique. I'll let others come up with the "official" reason, but he deserves to go, and no one from either party will shed many tears for him anyway. An obvious and gigantic miscalculation in retrospect, if that indeed was his thought process. But it's at least believable. Trump's weird behavior re: Comey seems to reflect a man accustomed to being a boss, unprepared to be a president.